The older I get, the more I am convinced the secret to happiness is in the countryside. The simple life. That’s how I’ve been cooking and baking lately, only a few steps using garden-fresh ingredients. Fancy electric appliances have been collecting dust a bit. Batter made with nothing more than a big bowl and wooden spoon has felt so rewarding. The goal for savory dishes has been to do it all in one pot, like my new favorite Rustic Beef Stew. Inspired by Jacques Pépin, this no-fuss meal is perfect anytime, whether it’s just a cozy evening at home with your sweetheart or gathering the whole family around the table, even on a weeknight. A humble piece of chuck slowly softens in the wine and absorbs the earthy mushrooms, bright carrots, sweet peas, mild onions, fragrant herbs. The sauce magically appears from nothing more than a good bottle of red wine combined with the natural juice from the beef and vegetables. A simple roux made with flour and butter brings all the flavors together in a rich gravy. There is nothing pretentious about this delightful dish that whispers memories of the French countryside with every bite. 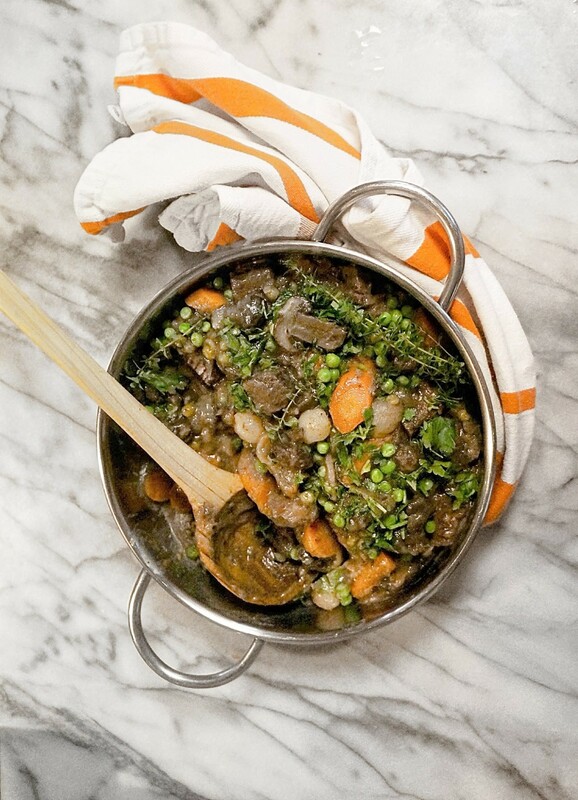 This French country stew defines what home means to each of us. Just bring the whole pot to the table, break a loaf of bread by hand and watch the faces around you shine. The first time I made this Rustic Beef Stew, I got Cipollini onions. Their round flying saucer shape looked beautiful among the peas and carrots floating in the sauce. Unfortunately, peeling them is quite tedious. The whole time I was suffering trying to peel them without slashing them to bits, I was tellling myself that my family is worth my suffering to make this healthy, delicious meal. Typical Armenian. Honestly, I’m not convinced they taste so different that it’s worth torturing yourself. Just toss a bag of frozen pearl onions into the pot. No one will ever mind. On a busy weeknight, after a long day at the office, when you’re craving something delicious that’s been cooking slowly for hours, this Rustic Beef Stew satisfies! Get some help with cut, peeled vegetables that you’ll find both in the fresh produce and freezer section. I normally avoid prepared fruits and vegetables since they’re so expensive. The only way I’ll ever get those pretty little Italian onions is if I find them peeled and ready to cook in a freezer bag! This is Farm-to-Table at its best. Everything that goes into the pot is fresh, if not frozen, and healthy. This is effortless Paleo. The wine I used to ma ke my stew was absolutely gorgeous. Rich and smooth, medium-bodied, a superior quality bourdeaux imported from France that retails at $19.99 was available for $8.99. Naturally, I got two bottles, one for cooking and another for sipping. There is an ongoing He-Said-She-Said debate at our homestead about the use of alcohol in cooking. Some insist that it is a shame to waste good beer or wine in a recipe. They believe it should be reserved for sipping. I, on the other hand, disagree. As the alcohol evaporates from the heat, the flavor intensifies. So, if you start with poor quality, you’ll end with even worse. This rustic beef stew is a sure success owing not just to the freshness of the meat and vegetables, but in large part to the quality of the wine. I’m not suggesting you pour a $200 bottle into the pot. Good wines are now available for under $20. Layer Cake is as much a pleasure in a glass as it is in a bowl. That said, you should get two bottles for this recipe. Here’s my take on French country life in the form of a hearty winter stew. Just toss everything into the crock pot and let it cook for 3 hours. If you don’t have the time, just go the old fashioned route and cook it on the stovetop. I just passed Shawn on my way home as he heads out to Olivia’s karate class. While they’re away, I’ll toss everything into a big pot and have dinner on the table by the time they walk through the door. The bay leaves and good wine give this stew a rich, slow-cooked taste. Remember, if the wine isn’t good enough to drink, it doesn’t belong in your dish! Add the frozen pearl onions toward the end. The peas should go in about 15 mins before you serve. A sprinkle of freshly chopped parsley makes for a bright finish. 4 medium red potatoes, peel and cut into quarters. If using a crock pot, just throw all the ingredients in and set it on low. If using a stove top, set a heavy bottomed pot on a medium flame. Add butter and olive oil. Cut meat into cubes and coat in flour. Add to the pot and brown on all sides. Season with freshly cracked black pepper. Smash garlic cloves, remove peel, set aside. Peel and chop onion. Add to the pot and brown. Cut mushrooms into big chunks and add to the pot. After 5 mins, pour the bottle of wine into the pot. Add bay leaves, thyme and tarragon. Add a generous splash of Worchestershire. Add carrots and put the lid on. Reduce flame to low and let it cook 30 mins. Cut potatoes into big chunks and add to the pot. 15 mins before serving, add frozen peas. Garnish with freshly chopped parsley and enjoy with that second bottle of wine and crusty baguette! You don’t even have to cut the meat into cubes. Coat it with flour and toss into the crock pot. It’ll cook down and become oh-so-tender. The flour helps thicken the stew. If you prefer, you can add a slurry of cold water & cornstarch toward the end as an alternate way to get that perfect consistency. This beef stew recipe is just so easy. The only work you actually need to do is turn the crock pot on, open a bottle of wine, and toss the meat and vegetables in. If you’re short on time, cook it on the stovetop in a big pot. It’ll taste just as good, if not better. This rustic beef stew is the perfect dish for busy times when you crave a comforting, home-cooked meal, but are really short on time and energy, like tonight. If you don’t have a crock pot, just throw everything into a heavy pot and set it onto a very low flame. The wine and juices from everything make a rich sauce perfect for mopping up with a slice of crusty baguette. It so easy, it practically cooks itself. You’ll have plenty of time to take a nap and even have a cup of tea before dinnertime. « Persian Rose Milk Pudding: Iranian Food Writers on Norouz, the Persian New Year!